When it comes to accuracy the Marlin 60 is touted to be one of the best .22 caliber handguns today. Aside from the great sense of accuracy it renders, this rifle also renders ease of use due to its lightweight characteristic. Thus, this makes it easier for just anyone to make use of it for shooting purposes. Now if you are thinking about equipping your Marlin 60 with an optic then you need to make sure that such traits of your firearm should remain. This makes you think that the best scope for Marlin 60 should have the following attributes: free of complication, compact and lightweight. It is also good to note that that the good characteristics of a Marlin 60 shouldn’t be affected by using any kind of accessory. Using a Marlin 60 makes your shooting activities fun and easy. However, it is important for you to know that this type of firearm lacks power when shooting at long-range. Not to mention that it can also be easily affected by strong winds due to its size and weight. Ideally, a Marlin 60 requires a sort-range and simple optic to provide clear sight at close ranges which is something that you may not achieve when you make use of a powerful scope that only tends to blur your targets at near or close range. Scopes that are beyond 9-power is not advisable for a Marlin 60 simply because they are not only heavier but more expensive as well. Choosing the best scope for your Marlin 60 also becomes easier for you because aside from the fact that we have chosen the best ones on the market today, we also formulated a review structure that allows you to choose the best scope in terms of complexity, precision, durability and cost. BSA Sweet .22 3-9 x 40mm Rifle Scope. With this scope, you can have the freedom to upgrade your plinker with crystal-clear precision that you may not be able to find from other scopes out there. This scope from BSA Optics grants serious optical power to any garden-variety .22 firearm, turning your plinker into a perfect varmint killer. There is no guessing game with this scope thanks to its .22-specific trajectory compensation and adjustable objective that makes shooting fun and easy. BARSKA 3-9×32 Plinker-22 Riflescope. This scope offers a striking performance for your rimfire. Whether you are up for a plinking or hunting activity you can take aim with the scope’s bright clear optics that also boasts the durability of high-end and costly scopes. Offers coated optics, a 30/30 reticle, 3/8” dovetail rings and caps. Tasco Rimfire 3-7x 20mm 30/30 Reticle Riflescope. With this kind of scope from Tasco you can have the freedom and the best opportunity to equip your small caliber with something that offers big time precision and plinking enjoyment that you cannot experience from other scopes out there. Specially calibrated for short-range shoots, Tasco Rimfire Riflescope also features coated optics for bright and clear images. BSA Sweet .22 3-9 x 40mm Rifle Scope. With this scope from BSA you can achieve crystal-clear precision, allowing you to realize shots that you will always remember. It comes with 3.9x magnification optics which are fully-coated, 40mm objective, 10.8-3.6 exit pupil, FOV at 100 yards is 36.6’at 3X and 15.7’ at 9X and 3-inch eye relief. All of these contribute to the high sense of precision that you can only get from this scope. BARSKA 3-9×32 Plinker-22 Riflescope. This scope equips .22 rim-fires and rifles to render striking performance and precision through its 3 to 9x magnification. Precision and accuracy is also achieved with its 10.7-3.6 exit pupil and 3.5-inch eye relief, 0.25-inch click value and 0.375-inch dovetail rings. Tasco Rimfire 3-7x 20mm 30/30 Reticle Riflescope. 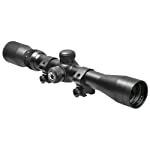 This scope from Tasco comes with quality optics with stunning high definition clarity. It also renders variable power performance for added versatility and shooting at longer distances. BSA Sweet .22 3-9 x 40mm Rifle Scope. This product is made from high quality materials and is designed to withstand water, fog and shock. This makes you think that no matter how rugged the situation you are into you can have the assurance that this scope will definitely stay strong and durable. BARSKA 3-9×32 Plinker-22 Riflescope. This scope from BARSKA is adjustable for windage and elevation and is also resistant to shock, water and fog. This scope with multi-coated optics can definitely stand the test of time with these characteristics that depict its strength, resilience and durability. Tasco Rimfire 3-7x 20mm 30/30 Reticle Riflescope. Something that this product can boast of is not only its beautiful design but its sense of durability that’s built to last. Materials that were used for its construction are of 100 percent quality and tested extensively. BSA Sweet .22 3-9 x 40mm Rifle Scope. Cost is something every buyer should consider when buying something such as the best scope for Marlin 60. Such scopes need not to be costly in any way and this particular scope from BSA is available at an affordable price of just below fifty bucks. It’s truly an affordable way to enhance your .22 rifle or Marlin 60. BARSKA 3-9×32 Plinker-22 Riflescope. Ever wondered how much a Marlin 60 scope can cost you? Compared to others, scopes that are intended for Marlin 60 usually cost below a hundred bucks and anything that’s beyond that price range is something too expensive and perhaps heavy for your firearm. This specific scope from BARSKA comes to you at a price that’s only below fifty bucks. Tasco Rimfire 3-7x 20mm 30/30 Reticle Riflescope. When it comes to price, this scope from Tasco is simply the winner. Tagged at a price of just less than twenty-five bucks, this scope is simply an affordable pick for your Marlin 60. IT’s such a perfect choice especially when you are on a tight budget or simply looking for something that’s not only high in quality but truly affordable as well. So, we are already done with the review of the three best scopes for Marlin 60. Basing from our comparison, we have come up to the point of realization that BSA Sweet .22 3-9 x 40mm Rifle Scope scored higher than our two other options which are the BARSKA 3-9×32 Plinker-22 Riflescope and Tasco Rimfire 3-7x 20mm 30/30 Reticle Riflescope. Obviously, BSA Sweet Riflescope was our pick for complexity and precision whereas the two others played well in the durability and cost respectively. But even so, it’s still up for you to decide on which among the three is the one that you should get for your Marlin 60. After all, we have chosen the best ones for you. Where can I get that green stock in the picture?